RMT Rope exercises using the “Dragon Roll" Technique improves rotation on a foundational level. The Dragon Roll Technique uses your hands, shoulders, core, hips, and feet simultaneously to improve global rotation, balance, coordination, timing, and athleticism. 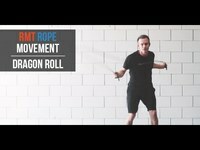 These videos will walk you through the Dragon Roll technique and how to incorporate it into your fitness routine.